My last post concerned a portrait of Elmira or Elma Kemp Chaplain (1837-1869), first wife of Talbot County Superintendent of Schools Alexander Chaplain (1835-1918). Emily Thomas, daughter of Dorchester County farmer Algernon Thomas and Deborah Shannahan, married Alexander Chaplain in 1872. In 1880, Emily bore a half-sister, Eleanor Chaplain, for her husband’s daughter Maude. 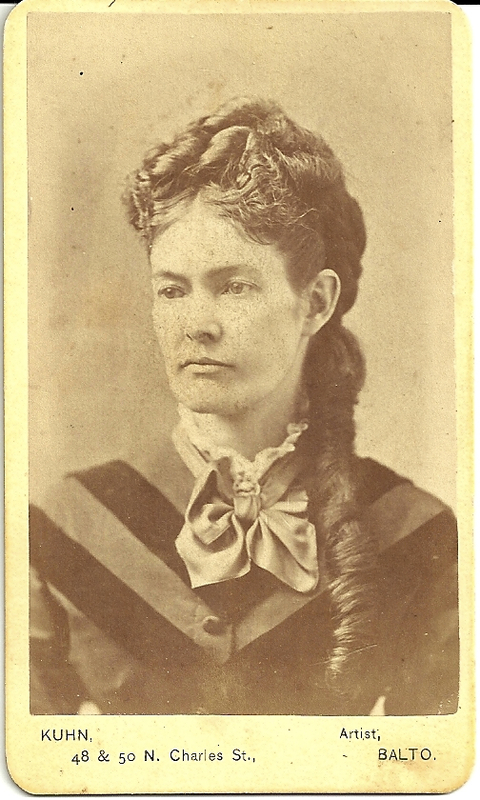 Emily sports a long curl worn over one shoulder, a style typical of the 1870s, and possibly made of false hair. Other surnames found in this album of mostly western Maryland portraits are Spalding, Bourne, Bowers, Willis and Martin. The presence of one Chaplain, referred to as the wife of an “uncle,” and another of Margie Robinson, one of Alexander Chaplain’s nieces (see previous posts under “Chaplain Family”), sent me on a frustrating search for family connections that remains full of unsolved puzzles.